The perfect weekend breakfast is here! 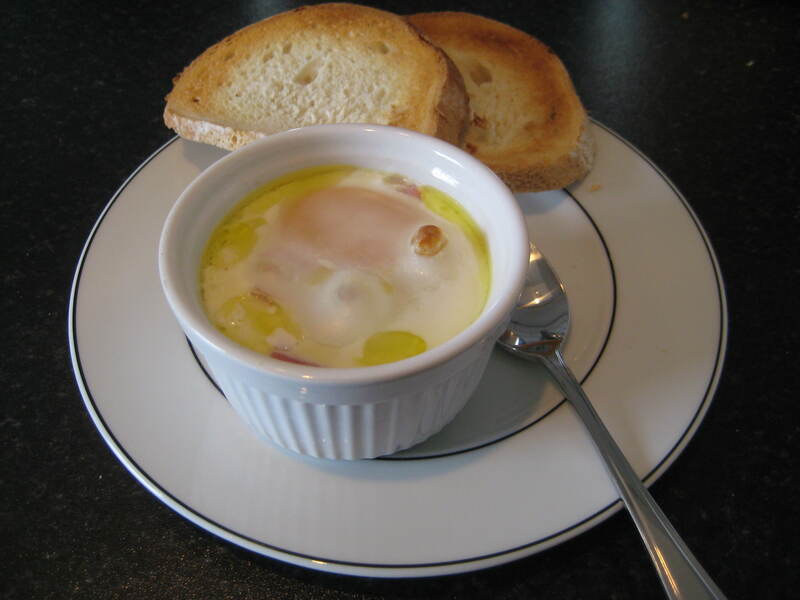 I made Oeufs en cocotte (eggs in ramekins) this morning and it was absolutely fantastic. This is great to serve for breakfast when you have people staying over or just at a treat at the weekend. It is really easy to make and only takes 15 minutes in the oven. Perfect! Promise me you will try this. I do like Nigella and add a little bit of truffle oil, but that is optional. I added some chopped smoked ham too, but you can add anything you like (chopped spinach, cooked mushrooms, chives) or keep it plain. Butter two ramekins, and add the chopped ham for example. Crack an egg into each ramekin, sprinkle over some sea salt and, pour in 1 tbsp cream and a little (1/4 – 1/2 tsp) truffle oil. Put the ramekins in an oven-proof dish and pour boiling water into the dish to come halfway up each ramekin. Bake in 190 C for 15 minutes. Serve with some nice bread.